Twitter photo. 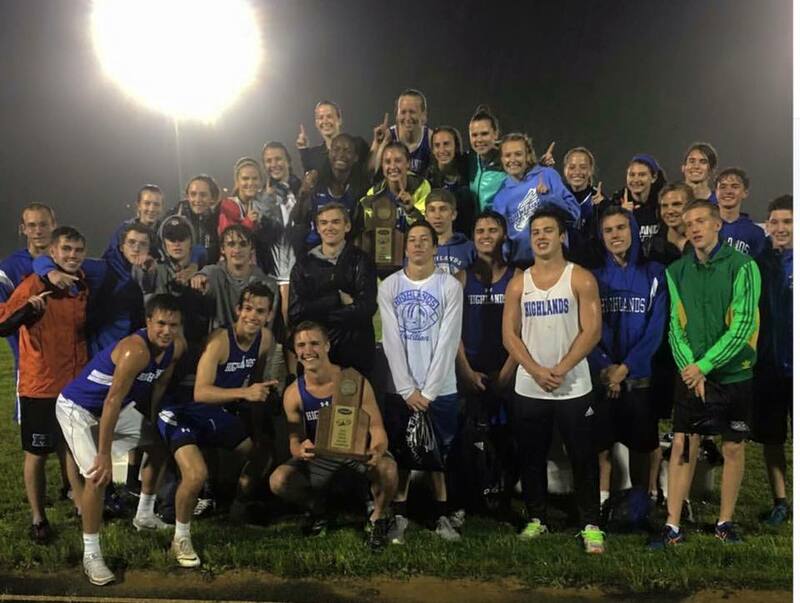 The Highlands track teams celebrate after winning the 4th Region on Saturday. They go to the state meet Friday at the University of Kentucky starting at 4:30 p.m. Many track teams are strong in distance. Some are strong only in sprinting events. It's the teams that can score many ways that win championships. The Highlands track teams have that depth to win the Class AA state championships Friday at the University of Kentucky. The teams would not mind capturing state championships in the same year for the first time in school history. The meet starts at 4:30 p.m. The Ladybirds are looking for their fifth state championship in school history. They won four straight from 2008 to 2011. Highlands finished fifth in the state last year. "In the past, I've said we had a shot and I've been a little bit too ambitious," said Brian Alessandro, Ladybird Head Coach. "But this one is a little different because we have points coming in different areas. I was looking at the performance list. I think we can score 75-80 points. That could possibly win it." The Bluebirds hope to win the fourth in school history. Highlands won it two years ago and also claimed championships in 1920 and 1959. The Bluebirds fell one point of a repeat last year. Paducah Tilghman edged Highlands, 81-80 for the 29th state championship in school history. Tilghman will be a challenger on both sides. "We (will) just try to take this week as any other week," said Ryan Leopold, Bluebirds Head Coach. "We really want it to be as normal as possible. They knew there are fewer guys here. They know it's a bigger meet for them." The top two performers in each event per region qualified for state. After that, the next 10 performances qualified making 24 in each event. Highlands ran the Region 4 meet in a downpour. Highlands has the top regional performances in the shot put entering the meet. Highlands seniors Mikayla Reichert threw it 33 feet, 10 inches and Tyler Robinson fired it 49-7. Reichert ranks second in the discus at 115-4. Elizabethtown senior Ngozi Akukwe ranks first in the discus at 119-10. Highlands also saw junior Mary Claire Redden qualify for the discus. She fired an 85-4 in the region. "We're taking practice really slow and doing technical drills," Reichert said. "We're seeing where our marks land and seeing if they're good enough to win state. We're encouraging each other to hit the marks we want to hit at state." Highlands junior Isabelle Ison is also one to watch in the pole vault. She hit 7-6 in the region good for eighth in region action. The Bluebirds look solid in the sprinting events led by Nick Kendall, Nick Veneman and Jared Pulsfort. Kendall won the 100 and 200 dashes at region. His 100 time of 11.4 ranks seventh and his 23.9 seconds in the 200 ranks sixth. Pulsfort ran the 400 in 51.8 seconds. That ranks sixth in state. "We're doing a lot of pacing learning how to run our races," Pulsfort said. "We're working on our starts like getting out of the first 50 meters fast because that's what is going to set the pace for the race." Sophomore Sophie Steppe leads the Ladybirds in the sprinting events. Her time of 1:01.81 ranks sixth in the 400 dash and her time of 27.48 ranks 14th in the 200. Junior Sydney Ossege ran a 27.20 in the 200 at region good for 11th. Junior Jake Hoarston and senior Kylie Schuerman could make an impact in the hurdles. Hoarston ran the 110 hurdles in 16.67 seconds good for seventh in region and 11th in the 300 hurdles in 43.6 seconds. Schuerman finished the 110 hurdles in 17.75 good for 11th. "If you get a good start, you can get a good rhythm of things," Schuerman said. "My sister was in that (2008-2011) mix. Every year, I've been wanting to get better." Highlands should score a good amount of points in the distance events. In cross country in the fall, Highlands won the girls AA state championship and the Bluebirds finished runner-up. Senior Lauren Ossege leads the Ladybirds. She ran the mile in 5:29.44 at region good for fifth in state and the two-mile in 12:10.28 good for sixth. Junior Chloe Gastright ran the two-mile in 12:00.48 good for third and senior Molly Mearns ran the 800 in 2:25.88 good for fifth. "We only have a few girls who have not competed at state, which is good because they don't have that shock value," Alessandro said. "On Thursday, we're going to take off. They're off school. We're going to go down and see what happens. I'm not putting any pressure on them." The Bluebirds have tried to make up for the loss of injured senior Ethan Shuley. Senior Geoffrey Mearns will run in both the mile and two-mile events. His mile time of 4:41.16 in region ranks sixth and his 10:09.59 two-mile run time ranks seventh. Junior Kevin Kreutzer finished fourth in the 800 in region times in 2:02.28. "Right now, we're just emphasizing time," Leopold said. "We're not worried about who the team is or what color the jersey is. Either your time is going to be good enough or it's not. Time is the difference. It doesn't matter what heat you're in. You could be in the fast heat, the middle heat or the last heat. As long as your chasing for time, you'll be fine." The relay teams are also strong. Both Highlands 400 relay teams won region. The Ladybird team of junior Addie Parris, Schuerman, Sydney Ossege and senior Rosemanie Long won it in 52.15 seconds ranking it seventh in region play. The Bluebird team of Hoarston, Kendall, junior Carter Burke and senior Ben Ziegler won in 46.22 good for fourth in the state. The Bluebird mile relay team of Pulsfort, Veneman, Kreutzer and Matthew Gray won the region in 3:39.09. That time ranks sixth in state. "We really push each other in practice every day, work on our handoffs and try to get better in relays," Veneman said. "Just the drop of a baton can really change places. It's all practice, timing and steps." The Ladybirds finished second in the mile relay in region. But that run in 4:13.30 ranks fourth in state. Molly Mearns, Sydney Ossege, Steppe and junior Beth Ann Griffith run on that team.